Inte för att jag planerar att cykla som ni gjort, men det är kul med statistik i alla fall! 22 USD per dag alltså. Hur lågt hade ni kunnat gå om ni verkligen pressat det? Inga restauranger, bara guesthouse när det var absolut nödvändigt. Några kläm till på tandkrämstuben etc? Testa på vägen hem! En annan reflektion är att det är billigare att ta flyget än att cykla till Thailand! Att cykla till Thailand tar c:a 10 månader och kostade 83.000 för två personer. Nu hade jag skrivit ett långt inlägg om hur bra ni är,men det förmår jag inte göra en gång till. Det försvann från min skärm i alla fall. Kul att få napp på bloggen igen. Puss o kram! Hej! Nu har jag läst igenom statistiken. Kan bara säga att det är glasklart och intressant. Den eller de som vill veta något om att resa med cykeln oavsett varthän kan med denna information lätt lägga upp en budget. A few years ago I biked to Italy and then back to Stockholm and loved it. The trip that you describe here is really close to one I have been thinking about doing for awhile. Considering that cost is always such a big part of planning, it is really great to see it broken down here so well, thanks. If I was to do this trip I would most likely do it on my own so I just had a few question. How do you think traveling alone would affect the cost ? How did you feel safety wise on the trip, do you think it would be safe to do alone? Having taken the trip would you have changed the route at all? Thanks again for good info! Sorry for the delayed reply to your comment. We have been busy returning home and setting up our apartment again. Regarding the costs for traveling alone. The only cost in our summary above which might be different for someone traveling alone is the cost for accommodation. A double room is a double room and if you can’t find anyone to share it with, then you have to pay the full price on your own. Of course this does not apply when you stay in a dormitory at a hostel. It is easy to camp in China, but when in a city you have to stay in a hotel with a license to host foreigners and those can be expensive. In smaller towns you can almost always count on finding a cheap room in a lousy hotel for less than 100 CNY and those usually don’t bother with licenses – they just want the quick buck. Regarding safety – we never felt insecure. People were nice to us all the way and the only thing that concerned us was road safety. We felt most safe on the roads in Uzbekistan and least safe on small roads in Poland and Georgia. If we would do this journey again we would skip the part in western China along the northern Taklamakan desert. It is far from being as nice as beautiful as in Kazakstan and Uzbekistan and there are more towns and cities so it doesn’t feel as adventurous as it did in Kazakstan and western Uzbekistan. We would also have taken a more western route through central China (south of Xining). And of course, we would have gone through Iran, but that wasn’t possible during the summer of 2013 due to the presidential elections. The world is more safe place than we usually think. And more cheep for living. Snezana – thanks for checking our blog 🙂 You are spot on in your comment that you can only spend as much money as you have…. We could have traveled for much less money. In our case we were fortunate to have some savings, but of course it is possible to live on 5 Euros per day (excluding visa costs I assume… ) We like camping but whenever we found a hotel for 5-10 Euros per night we couldn’t simply bother to pitch our tent which have meant that our spendings was a bit high. And the world is a pretty safe place. People are generally friendly. What an amazingly detailed piece of analysis. Thanks for taking the trouble to do this and post it. We aren’t planning on anything like this ourselves but the principle hold for any trip so it’s really useful. I guess a backpacker would get similar costs. They will probably spend more on “activities” and “transports” but less on maintenance and spare parts. Thank you for the hard work of breaking down your costs. I have learned a great deal from this one posting. It’s great to see that you’ve taken the time and effort to produce these spending charts, it’s going to be really useful for people planning a similar trip. And kudos for explaining your type of budget and what sort of spending philosophy you had. 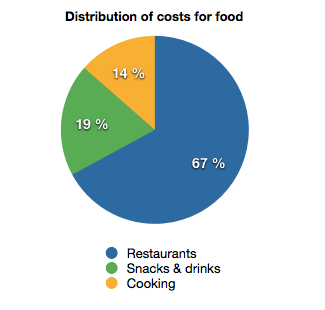 I’ve not seen a cost breakdown like this before and wish I’d taken similar notes. I’ve not had a chance to read through your blog but with a quick browse it looks like you’ve had an amazing journey, it’d be a dream of mine to one day do something similar from Europe to Australia. Stort grattis till er lyckade resa och till all matnyttig info. PS. Jag har planerat för samma väg som er till Bangkok, med undantag för att jag cyklar genom Iran och gör en avstickare genom Tajikistan längs Pamir hwy. Låter som om du är ute på en härlig resa och kul att du hittat vår blogg. Mejlar dig privat i morgon. Amazing journey guys! And thank you for posting the very helpful monetary breakdown. Really interesting and useful. I am currently on a cycle trip from UK to Singapore and my planned route from Istanbul to Bangkok seems identical to yours. I would really value any advice or tips you can give, especially about applying for visas and also anything particular that you would recommend visiting along the way. Am I right in thinking that you got your Kazakstan and Uzbekistan visas in Baku? Where did you get your Chinese visa? Any recommendations for tour companies for visa applications? Many thanks for your help. Apologies for posting this on your website but I couldn’t find an email address to contact you on. Nice that you found our blog. I will soon send you a mail with answers to your question to the e-mail address you provided when you wrote this comment. Thank you for this super informative post. Me and my boyfriend are planning a year long trip to from the Netherlands to Asia and back again and your cost breakdown with detailed explanation is a great help in planning the financial side. All the best on your future (bicycle) adventures! Sounds like you are planning a great trip. I´m happy you found our cost breakdown useful. I remember before we started our trip how hard it was to find info about costs and that was why we decided to make this presentation in order to help others. Will you blog during your trip? Yes, this is our blog: http://www.oufti.nl. We are now very close to our leaving date, only 4 more weeks until we hit the road. I just wrote a blog post about the budget part of the preparation and made a mention of your blog. Thanks for the link to the other blog you recently added, will check it out too. I am glad you found our post about the costs useful. It would be great to afterwards see if your actual costs matched ours. I signed up on your mail list to follow your blog. Looking forward to the reading. If you are interested in more details about the Bartang, just make a note here and I´ll e-mail you back. And yes – once you´ve started to travel by bike you can´t stop. Last summer we made a short trip to Armenia and Nagorno Karabakh. Wonderful places too and sadly recently plagued by new military fighting. We wish you all the best for your coming adventure. I’m Pierre, French canadian from Quebec City. Nice to visit your blog and found very interesting informations. Can you show me how did you build your spread sheet to complilate your travel expenses by countries and categories? I´m happy you found this blog post informative. I´m also sorry for the delay in responding to your question. We kept two separate excel files for our follow up. The first file contained all our spendings. We made one row for each day and one column for every cost type (accomodation, food etc). Every row (day) then had a number of entries depending of what kind of spendings we had had. We put in all the spending in local currency and afterwards calculated an average exchange rate. 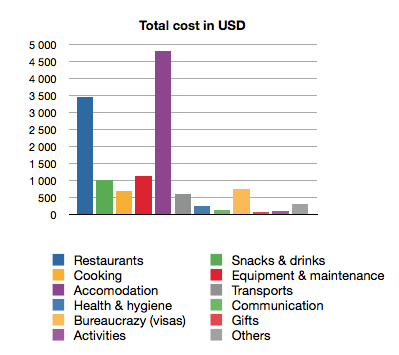 When exiting one country we could quickly get a summary of all our spendings per cost category in that country. The other file contained travel our data which also was a spreadsheet with one line per day where we entered start and end points, average speed, gained altitude etc. Besides that we also made a note of where we slept, if it was a paid or unpaid accomodation and what kind of accomodation it was (hostel, hotel, invited, camping). This info was needed for calculating average costs for accomodation. 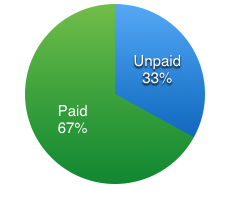 When we wrote this cost summary blog post we simply put together all the information and made pie charts in excel. We then took a screenshot of the pie charts for every visited country and uploaded them to the blog. I´m not sure if my explanation is clear enough. If not, you are more than welcome to contact me. I could even mail you a copy of our template files. Jean Michel and Julie from Malaysia. We met in Osh at the guest house. Do you have an email address?